In some cases, a search can be reasonable — and thus allowed under the Fourth Amendment — even if the police don’t have a warrant. There are several key exceptions to the warrant requirement that you should be aware of. Consent. The police can conduct a warrantless search if you voluntarily consent to the search — that is, if you say it’s OK. In fact, any person who the police reasonably think has a right to use or occupy the property, like a roommate or guest in your home, or a coworker at your office, can consent to the search. You can make clear to the people you share a home or office with that they do not have your permission to consent to a search and that if police ask, they should say no. Privacy tip: Don’t accidentally consent!If the police show up at your door without a warrant, step outside then close and lock the door behind you — if you don’t, they might just walk in, and later argue that you implied an invitation by leaving the door open. If they ask to come in, tell them “I do not consent to a search.” Tell roommates, guests, coworkers and renters that they cannot consent on your behalf. Administrative searches. In some cases, the government can conduct administrative searches. These are searches done for purposes other than law enforcement; for example, for a fire inspection. Court authorization is required for involuntary administrative searches, although the standards are lower. The only time the government doesn’t need a warrant for an administrative search is when they are searching businesses in highly regulated industries such as liquor, guns, strip mining, waste management, nuclear power, etc. This exception to the warrant requirement clearly does not apply to the average homeowner, activist organization or community group. Privacy tip: Just because they’re “inspectors” doesn’t mean you have to let them in!If someone shows up at your home or office claiming to be a fire inspector, building code inspector, or some other non-law enforcement government employee who wants to inspect the premises, you can tell them to come back with a warrant. You don’t have to let them in without a warrant! Exigent circumstances. Exigent circumstances are emergency situations where it would be unreasonable for the police to wait to get a warrant, like if a person is calling for help from inside your house, if the police are chasing a criminal suspect who runs into an office or home, or if evidence will be destroyed if the police do not act immediately. Plain view. The police can make a warrantless search or seizure if they are lawfully in a position to see and access the evidence, so long as that evidence is obviously incriminating. For example, if the police enter a house with a valid search warrant to search for and seize some stolen electronics and then see a bag of drugs in plain view on the coffee table, they can seize the drugs too, even though the warrant didn’t specifically authorize that seizure. Similarly, the police could seize the drugs without a warrant, or look at any other documents or things left in plain view in the house, if there were exigent circumstances that led the police into the house — for example, if a suspect they were chasing ran into the house, or if they heard gunshots from inside. Even a law-abiding citizen who does not have any contraband or evidence that the police would want to seize may still have sensitive documents in plain view that one would not want the authorities to see. The plain view exception alone does not allow the police to enter your home or office without a warrant. So, for example, even if the police see evidence through your window, they cannot enter and seize it. However, plain view can combine with other exceptions to allow searches that might otherwise require a warrant. For example, if the person with the bag of drugs in the previous example saw the police looking through his window, then grabbed the bag and ran towards the bathroom as if he was about to flush the evidence down the toilet, that would be an exigent circumstance and the police could enter without a warrant to stop him. Automobiles. Since cars and other vehicles are mobile, and therefore might not be around later if the police need to go get a warrant, the police can search them without one. They still need probable cause, though, because you do have a privacy interest in your vehicle. If the police have probable cause, they can search the entire vehicle (including the trunk) and all containers in the vehicle that might contain the object for which they are searching. For example, if the police have probable cause to believe that drugs are in the vehicle, they can search almost any container, but if they have probable cause to believe that a murder suspect is hiding inside the vehicle, they must limit their search to areas where a person can hide. Also, it’s important to know that the “plain view” exception is often applied to cars. That means that the police aren’t conducting a search just by looking through your car windows, or even by shining a flashlight in your car. And if they see evidence inside your car, that can then give them probable cause to search the rest of the vehicle under the automobile exception. Police at the (car) door: What if I get pulled over?If you are pulled over by a police officer, you may choose to stop somewhere you feel safe, both from traffic and from the officer herself. In other words, you can pull into a lighted gas station, or in front of someone’s home or somewhere there are other people present, rather than stopping on a dark road, so long as you indicate to the officer by your driving that you are in fact stopping. You are required to show the officer your license, insurance and registration. Keep your hands where the officer can see them at all times. For example, you can wait to get your documentation out when the officer is standing near your car so that she can watch what you are doing and have no cause to fear that you are going into the glove box for a weapon. Be polite and courteous. Airport searches. As you certainly know if you’ve flown recently, the government is allowed to search you and all your luggage for bombs and weapons before you are allowed to board a plane, without a warrant. Always assume that the government will look in your bags when you fly, and pack accordingly. Border searches. The government has the right to warrantlessly search travelers at the border, including international airports, as part of its traditional power to control the flow of items into and out of the country. 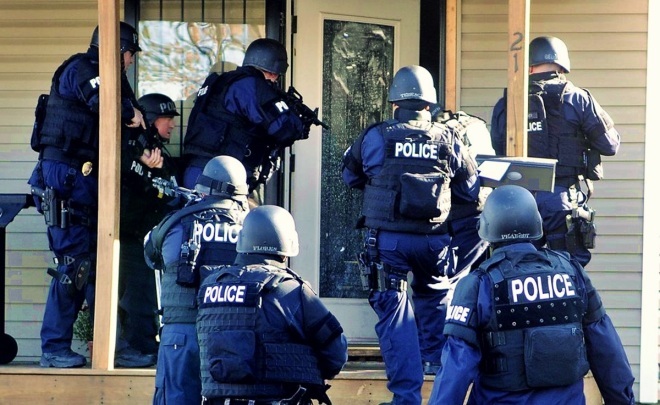 The case law distinguishes between “routine” searches, which require no cause, and “non-routine” searches, which require reasonable suspicion, but no warrant. “Non-routine” searches include strip searches, cavity searches, involuntary X-rays and other particularly invasive investigative techniques. Several courts have found that searching the contents of your laptop or other electronic devices is “routine” and doesn’t require a warrant or even reasonable suspicion. However, bringing a clean laptop means more than simply dragging files into the trash. Deleting files will not remove them from your hard drive. See our software and technology article on secure deletionfor details. Another solution is to use password-based disk encryption to prevent border agents from being able to read your files. The consequences of refusing to disclose a password under those circumstances are difficult to predict with certainty, but non-citizens would face a significant risk of being refused entry to the country. Citizens cannot be refused entry, but could be detained until the border agents decide what to do, which may include seizing your computer. Stop and frisk searches. The police can stop you on the street and perform a limited “pat-down” search or “frisk” — this means they can feel around your outer clothing for concealed weapons. The police don’t need probable cause to stop and frisk you, but they do at least need to have a reasonable suspicion of criminal activity based on specific facts. This is a very low standard, though, and the courts usually give the police a lot of leeway. For example, if a police officer is suspicious that you’re carrying a concealed weapon based on the shape of a lump under your jacket or the funny way that you’re walking, that’s usually enough. If, while patting you down, a police officer feels something that he reasonably believes is a weapon or an illegal item, the officer can reach into your clothes and seize that item.